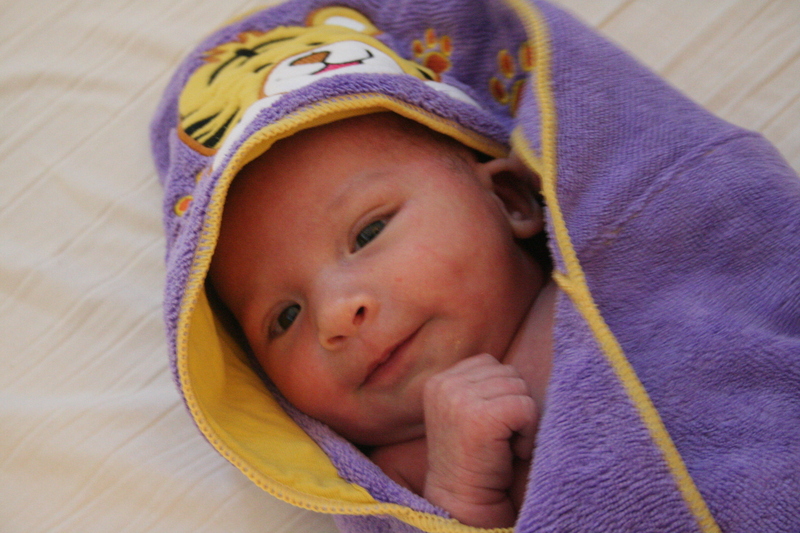 When I was a couple of weeks old, Mommy and Daddy gave me my first real bath. Oh, and Grandpa was there, too! Before that, they’d just given me little sponge baths because we had to wait for that weird thing to fall off of my tummy. Well, it finally did and then I got my first bath. As you can see, I really wasn’t too sure how I felt about it at first. Yeah, I really didn’t like it. Then I relaxed a little bit and realized that it wasn’t too bad. When it was over, they wrapped me up in this really cute towel that one of my relatives gave me. I liked this part. This first time was a bit shaky, but now I love bathtime!